The U.S. Small Business Administration recently stated that the number of small businesses has increased nearly 50 percent since 1982. This steady influx of entrepreneurs striking out on their own has led to a growth in the number of people who are embracing the latest and greatest technologies upon which to run their nascent businesses. Looking at the state of the small business world today, the technology du jour is no doubt cloud services. While small and midsize businesses are still lagging behind their enterprise brethren when it comes to implementing cloud services, entrepreneurs across a wide array of industries are growing more comfortable with the idea and are ditching legacy hard drives and on-site servers for apps in the cloud. I can’t blame them. Using the cloud brings a host of benefits. It helps reduce IT costs and minimizes the need for more hardware, software licenses and maintenance. Additionally, the rise of SaaS has brought about new ways to increase efficiency and boost collaboration and ultimately, productivity. As CEO of a burgeoning tech company that is 100% reliant on the cloud, I’ve seen first hand the success it can enable. While at face value anything that improves a workplace is good, it’s critical for small business owners to understand the limitations of cloud services in terms of keeping data safe. For example, your marketing department may be saving new product launch timeline spreadsheets in Google Docs. What happens if Steve, the team’s newest employee, accidentally deletes three months worth of numbers because he is unfamiliar with using the platform? While Google does back up its Google Apps services in case of server error, the company doesn’t protect against user error. That information is gone. More than one in five small-to-medium-sized businesses have experienced data loss that caused significant impact to their business, according to a study by Paragon Software Group, and astonishingly, 70 percent of these go out of business within a year of the event, according to PricewaterhouseCoopers research. The same issues that have existed in legacy hardware platforms – user error, sync malfunctions and even hacking – exist in the cloud. 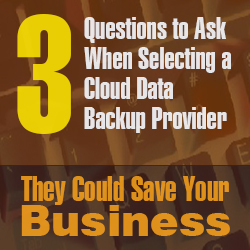 In order to maintain the collaborative and efficient characteristics that make cloud services like Google Apps and Salesforce great, it’s important for business owners and their IT managers to fully understand how these third-party services operate from a backup and restore perspective. From there, it’s critical they implement a solution that not only backs up data, but even more importantly, can restore data to their original state quickly and easily. 1. Can your metadata, not just files, be automatically backed up daily? This is critical to get data back to its original state with minimal headaches. You don’t want a solution that simply gives you reams and reams of unorganized data, forcing you to have to look for that one piece of lost data – the ‘needle in a haystack’ problem. You need a solution that rewinds time and puts everything back as it was before the data loss causing event occurred. 2. Can you pick and choose what to restore, no matter how granular the piece of data? The key is a service that gives you the flexibility to select what and when you want to restore, as opposed to one that limits you to a ‘one-size-fits-all’ option. In Salesforce for example, you may not need to restore all of your data for all of your accounts, but rather just a few select fields for a set of key accounts that were affected by a user’s upload or merging activities. 3. Is the vendor fully transparent about your backup successes (and failures) and your data quality issues? Be sure your backup provider gives you daily status reports to show where data quality may be an issue. Sometimes you may be completely unaware of corrupt files and there is no way of detecting these without your provider alerting you to the situation. Don’t wait until you need to recover lost data to find out you’ve actually lost data. The cloud is fantastic and will continue to enhance how we all do business, but those who are serious about data protection and availability must do their homework when it comes to identifying the most suitable service offering to meet their needs. Only then will they avoid data loss roadblocks that can derail an upward growth trajectory. Jeff leads the Spanning team not just in the ways you’d expect – such as developing strategy, budgeting, and recruiting – but also by enabling great people to do their best work. This means setting goals that inspire excellence while eliminating obstacles to success. 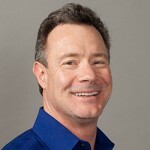 Prior to being appointed CEO and president, Jeff was Spanning’s Chief Revenue Officer. Before that, he was the president of Manticore Technology, which he led through three successive years of revenue growth in the highly competitive marketing automation market. He was the founding CEO of Deepfile Corporation (became StoredIQ and sold to IBM in 2012), was VP of Market Development at Digby, and served as Vignette Corporation’s first VP of Marketing. He started his career with NCR Corporation and also held senior management positions at Compaq Computer Corporation. Away from work, he is a connoisseur of New Orleans jazz and loves cooking with his wife - it’s the perfect blend of planning, creativity, and gadgetry for a technology entrepreneur and CEO. Jeff holds a BA in management science from the University of California at San Diego. He has also served as an adjunct professor of entrepreneurship in the Graduate School of Business at the University of Texas. In spite of this formidable career, it’s hard to get Jeff to toot his own horn - even though he’s a skilled trumpet player in addition to our president and CEO.